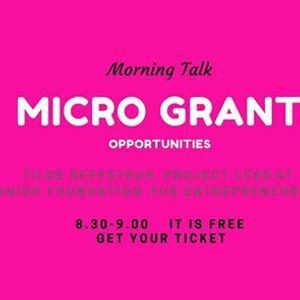 WANNA APPLY FOR A MICRO GRANT?? Have you considered applying for a Micro Grant – or a Global Goal Micro Grant? Then show up on March 20 when Tilde Reffstrup Project Lead at the Danish Foundation for Entrepreneurship will be your personal guide into what the two funding schemes require from you as an applicant! If you have a great student startup the Danish Foundation for Entrepreneurship has an opportunity for you. Either a Micro Grant – which you can apply for with or without a CVR – and receive either 25.000 kr. or 50.000 kr. However, there is also a new #aarsome possibility: Global Goal Micro Grant. 2️⃣ What should you consider, if you apply for a Micro Grant or a Global Goal Micro Grant? How does it work? 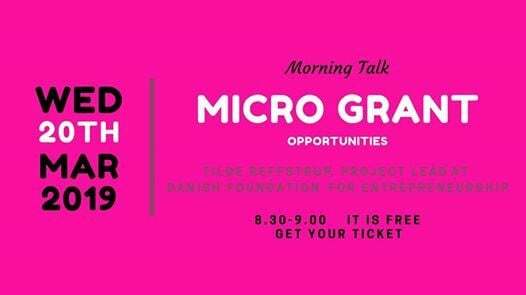 Tilde Reffstrup has worked for the Danish Foundation for Entrepreneurship for eight years and is the main force behind the Micro Grant initiative. Furthermore, she is the lead of ‘Young Global Goals entrepreneurs’ a project collaboration with Tuborgfondet. Tilde Reffstrup has a Master Degree in Economics and marketing from CBS with a minor in Sustainable Business and a bachelor degree in Business Administration from Roskilde University.